Gets the SourceBuffer object that created a specific VideoTrack. 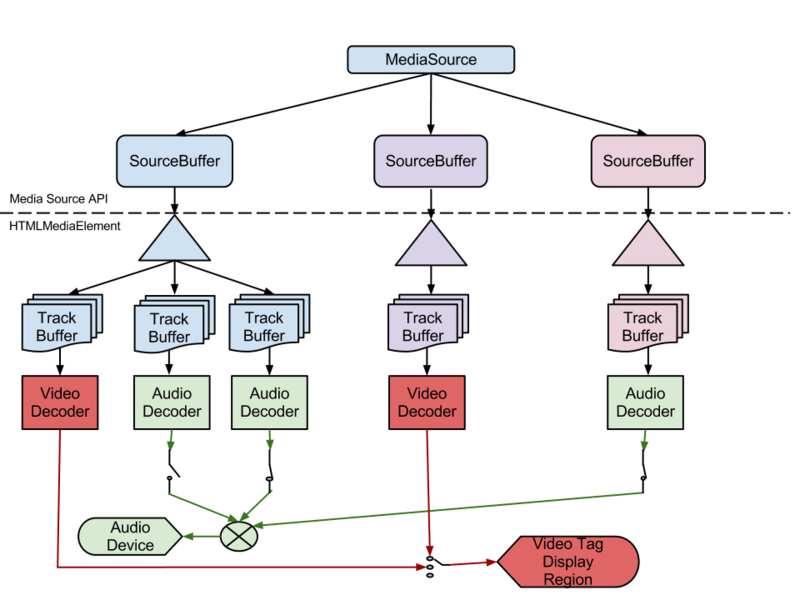 If videoTrack was not created by any SourceBuffer object in sourceBuffers then return null. Return the SourceBuffer object in sourceBuffers that created videoTrack. Gets the SourceBuffer object that created a specific AudioTrack. If audioTrack was not created by any SourceBuffer object in sourceBuffers then return null. Return the SourceBuffer object in sourceBuffers that created audioTrack. Gets the SourceBuffer object that created a specific TextTrack. If textTrack was not created by any SourceBuffer object in sourceBuffers then return null. Return the SourceBuffer object in sourceBuffers that created textTrack. Set the kind and language of the VideoTrack track. This method would be unnecessary if the kind and language attributes of VideoTrack were not read-only. Set the kind and language of the AudioTrack track. This method would be unnecessary if the kind and language attributes of AudioTrack were not read-only. Set the kind and language of the TextTrack track. This method would be unnecessary if the kind and language attributes of TextTrack were not read-only. The web application can monitor changes in HTMLMediaElement.readyState to drive media segment appending. Bug 18592 - How much is "enough data to ensure uninterrupted playback"
Indicates whether an appendArrayBuffer() or appendStream() operation is still being processed. Set the appending attribute to false. Queue a task to fire a simple event named appendend at this SourceBuffer object. If the appending attribute equals true, then throw an INVALID_STATE_ERR exception and abort these steps. Set the appending attribute to true. Queue a task to fire a simple event named appendstart at this SourceBuffer object. If maxSize equals 0, then abort these steps. appendstart Event appending transitions from false to true. appendend Event appending transitions from true to false. abort Event The append was aborted by an abort() call. Loop Done: Set the appending attribute to false. Add new audio track to audioTracks. Add new video track to videoTracks. Add new text track to textTracks.